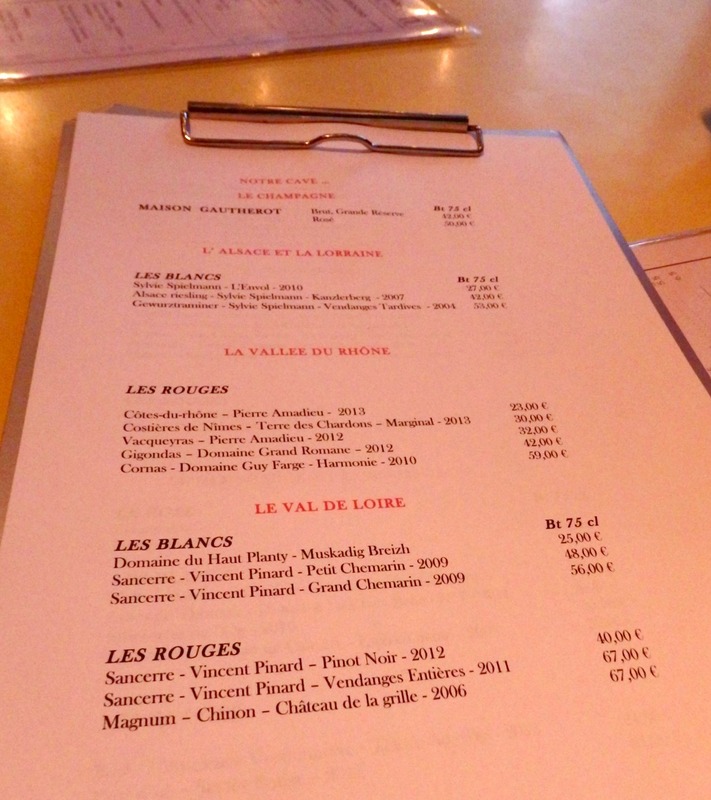 It’s hard to think about France without thinking of wine, so it’s not surprising that there are tons of wine bars (or cave à vins) in the city. 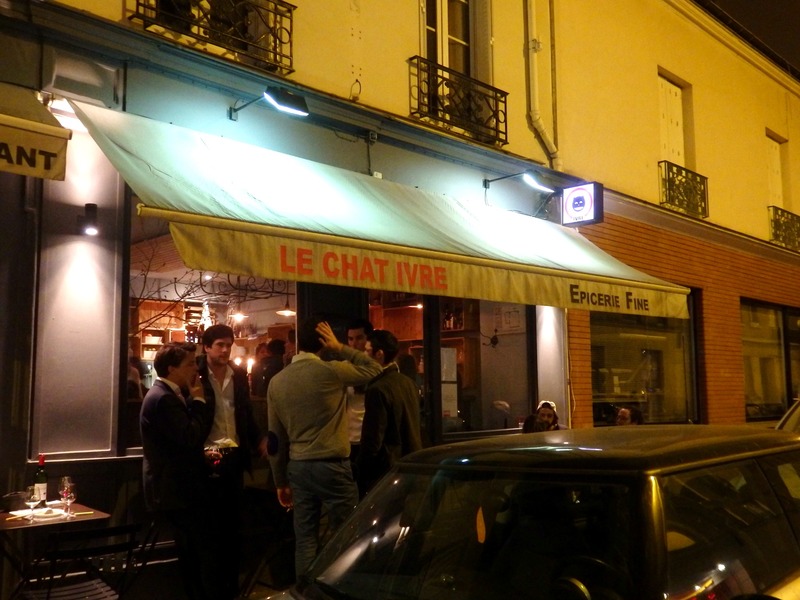 One of those wine bars, Le Chat Ivre (which translates as the drunken cat) is located in a quiet street not too far from Place de la Bastille in Paris. When my friend V suggested this place I was like “hell yeah”, as I cannot resist a bar with a funny name! So Friday night I reserved a table for myself and three of my favorite ex-colleagues to meet up for a long overdue get-together. 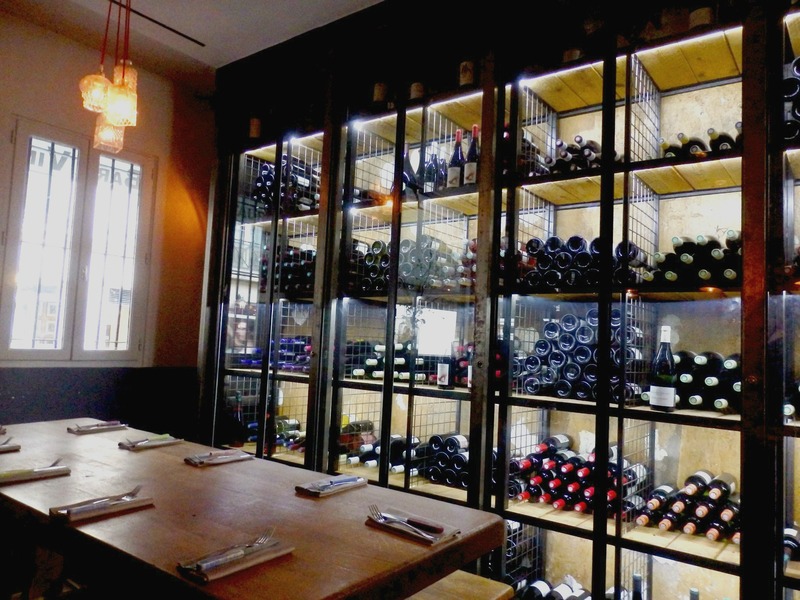 The décor is classy but casual, with light wood tables and dangling light fixtures as well as floor to ceiling metal shelves (similar to those you’d see in a large wine cellar) stocked full of various bottles of red and white wines. An inviting bar welcomes you as you enter, with a selection of French cheese and charcuterie strategically displayed at the far end for all to see. With V and C, we sat down at our table and started pouring over the extensive list of wines and tapas. We all ordered a glass of Chardonnay (6 Euros) and immediately decided upon the game plan of selecting two tapas dishes each, which we would all share (…for the most part ;))! 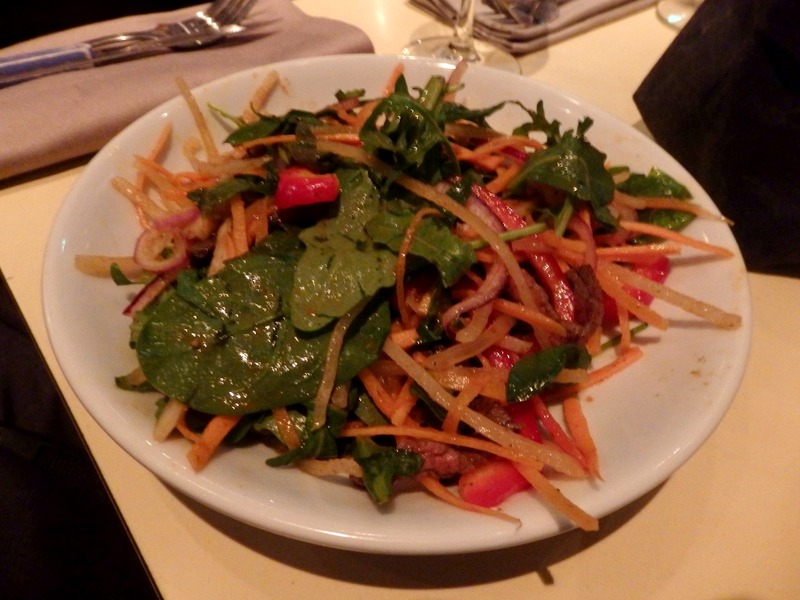 I LOVE places that offer little dishes to share, as I always have trouble deciding what to order and want to try everything! R was really late, so we started with some haddock accras (7 Euros) accompanied by sweet and sour dipping sauce, to help us survive until he arrived. 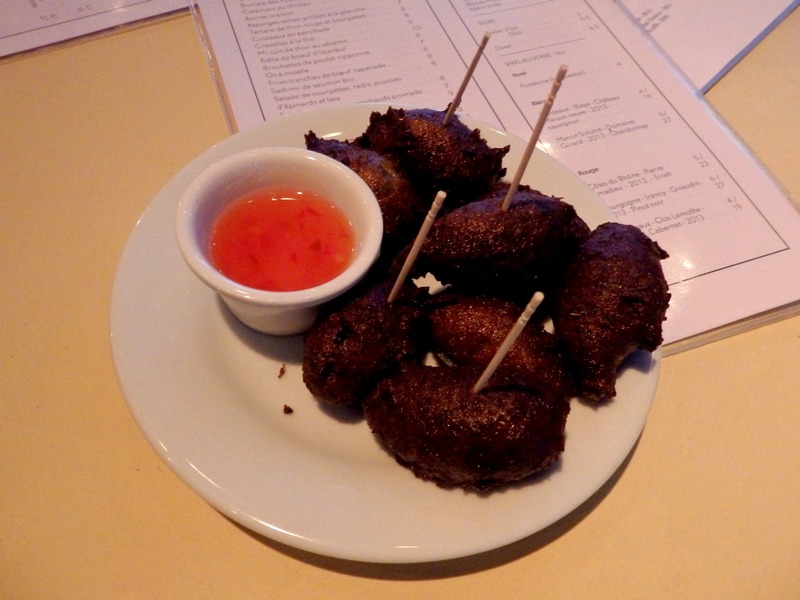 Funnily enough, R arrived shortly after the accras, and with all four of us present we were finally ready to order. 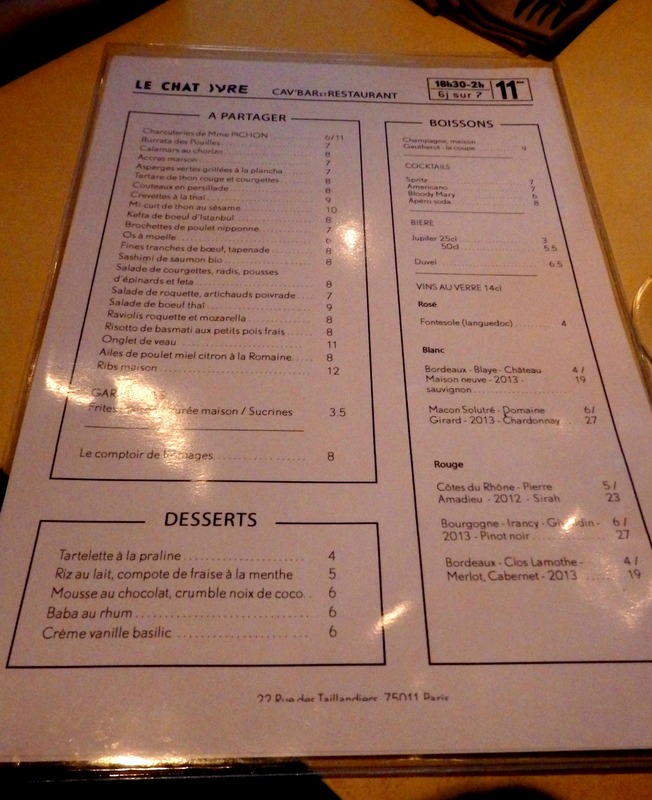 We chose 8 dishes (which range from 6-12 Euros each) and a bottle of Chardonnay (2013 Domaine Girard Mâcon-Solutré; 27 Euros) and started catching up with everyone’s latest news. FYI, we shared an office together several years ago and I still consider them as my ultimate “dream team” of office mates, based on the amount of laughter we experienced on a daily basis. 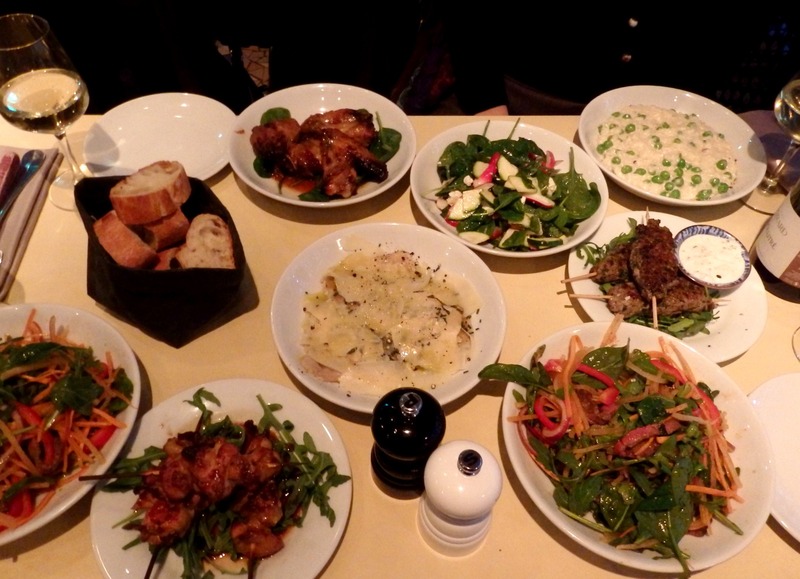 The food arrived all at once, and with each plate, our little table became more and more crowded with colorful dishes! 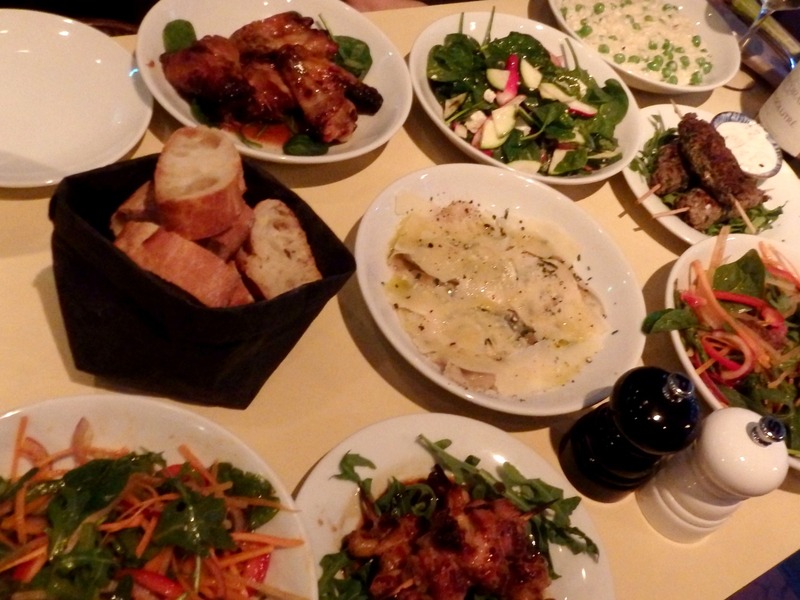 My favorites were the fresh green pea risotto, the arugula and mozzarella ravioli (covered in Parmesan shavings and black pepper), the refreshing Thai beef salad, the juicy honey lemon chicken wings, and a zucchini, radish, spinach leaf and feta salad. 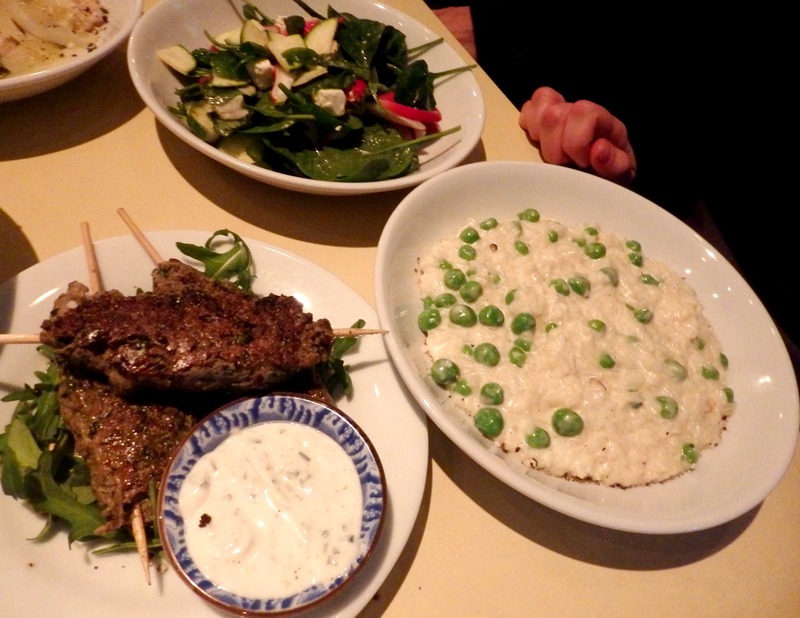 Oh, and the deliciously seasoned beef kofta with yogurt dipping sauce…okay …basically everything was pretty enjoyable! I admit that I don’t know much about wine (apart from how to drink it in large quantities) but the Chardonnay was particularly nice, which leads me to believe that it must have passed a careful inspection by a wine connoisseur before appearing on the menu. We chatted for the next 2 hours over the loud hum of happy clients and instrumental background music. The two guys, as well as the waitress who served us, were attentive and very friendly, which made me appreciate this place even more. In the end we paid 30 Euros each, which I found to be very reasonable. With the amount of food we ate, none of us left as drunken cats, but we definitely left very happy. 4 tipsy felines out of 5! 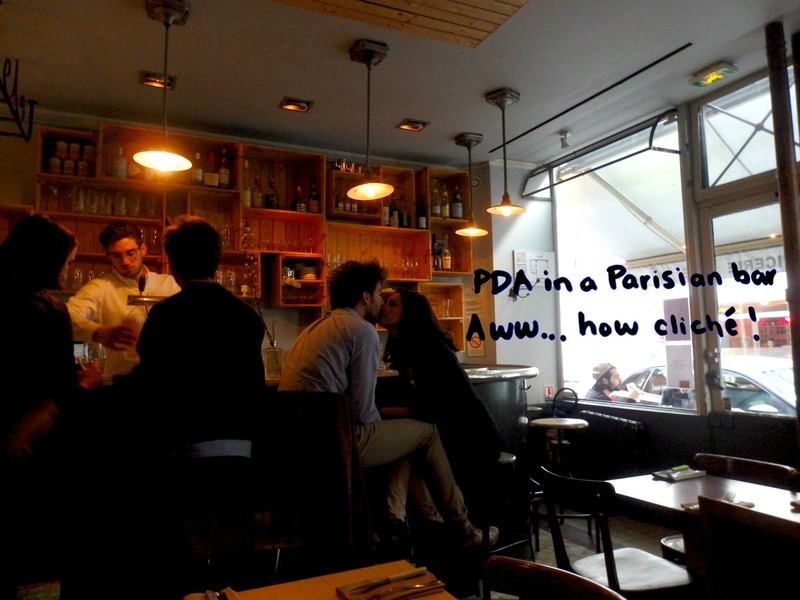 Categories: Uncategorized | Tags: bastille, drinks, friendly, paris restaurants, share plates, tapas, wine bar | Permalink.